While the idea of florals for spring may get you, at best, an eye roll, it’s winter florals that have me feeling like the below designers are really onto something. After all, what better way to infuse some life into the inevitable monotony of dressing for cold weather than to put a flower—or hundreds­—on it? After investing in a leopard puffer earlier in the season, I can tell you from experience that in a sea of black outerwear, a little print can go a long way, which is why I have my sights set on one of the floral pieces you're about to see. From Brock Collection’s long, Victorian-inspired coat, complete with the most romantic, contrasting ribbons, to Moncler’s cropped puffer that defines the modern way to do retro ski vibes to Urban Outfitters’ unexpected yet delightful nod to Penny Lane’s iconic outerwear, keep scrolling to see my favorite floral coats for the winter months ahead. I know this is why you clicked into this story, and I can't blame you. I'd wear this on or off the slopes. This is the kind of coat that makes an outfit. I imagine this is how Penny Lane from Almost Famous would do it. Acne Studios can make any trend look effortless. Faux fur and florals make quite the match. The dark backdrop gives this one a little edge. An iteration you can wear every day. You can wear this one well into spring, too. There's no trend Vetements doesn't touch. I'll take the whole outfit. I'd style this over my typical all-black uniform any day. I think I need this coat and a pair of retro knee-high boots now. Another style that would take you into spring seamlessly. This is like a coat and a dress in one. 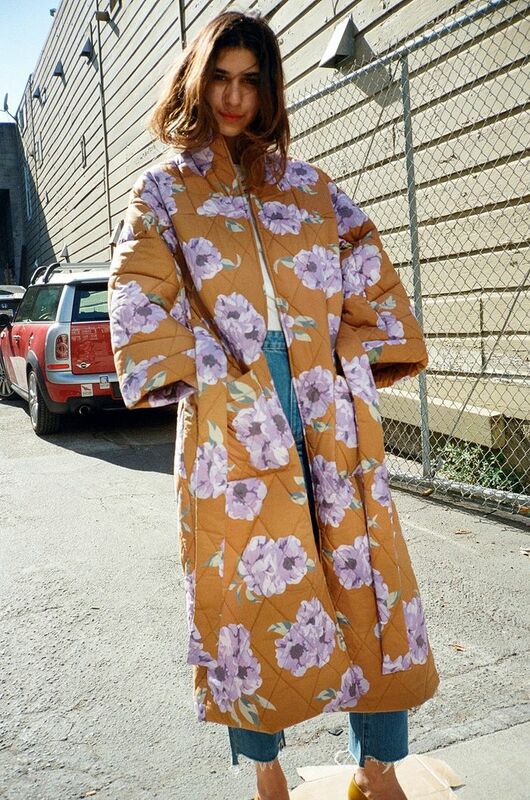 This Prada coat is a true investment piece. Last, but not least, a puffer you can wear day or night.